After careful thought, I decided to start a separate build thread for C.A. Farms. The layout is being built in Gn15 scale. The reason for this is that I'm pretty much going the scratch-build everything and it is easier in this scale. The shoe-box is 14.25 in. x 10.5 in. x 4.75 in. with a 17.5 in fiddle-yard off scene. The base is foam core sealed with paint to keep it from water damage during the scenery placement. Most of the structures and walls are foam core covered with paper textures printed from the internet. The track is held down with double stick tape and has been ballasted and sprayed with a 50/50 solution of water & white glue. When this dried the track was not going anywhere. The turnout is only partially visible in the scene with the rest as part of the fiddle-yard. The power also comes through the fiddle-yard. The track had every third tie removed and two pushed together to give it the short-line look. The track is Ho scale. 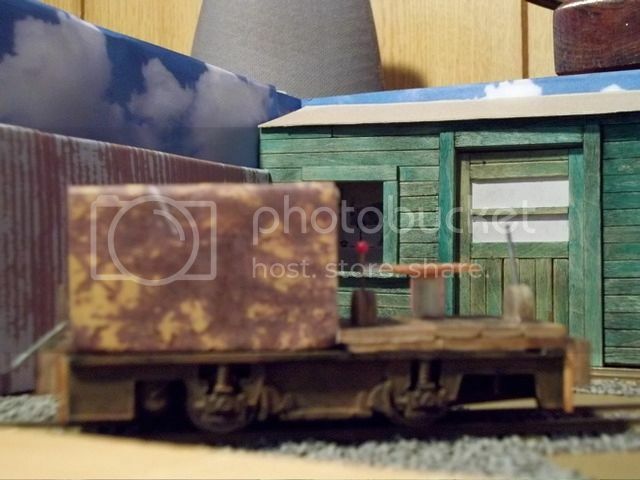 The small flat wagon is scratch-built using a shortened Ho scale chassis and craft sticks. Made my own buffers with a short piece of brass rod as the pin for the link to go on. That's about it so far. Any comments or suggestions are always welcome. That is looking nice, Larry. What are you planning for motive power? Presumably a critter of some description. What about other scenery? Is there going to be a loading dock of something at the front of the layout? Looks like you are off to a great start Larry! Neil: Yes I have other things planned for the layout. For starters I'm reworking a 0-4-0 diesel switcher into a critter. Just need to make a hood assembly and put in a seat and the basic critter will be ready for painting and detailing. Also working on another flat-car for the layout. Not quite sure what I'm going to do in the front of the layout yet, but I'm sure an idea will come along. Once I get the basic layout built and scenery down, then I can start detailing this thing to the max. Stay tuned. Been having software issues with my computer so I have not been able to post any progress pics. Finally went to my spare computer so I can now post. Anyway, have made some progress on the layout. The basic scenery material is in place. Used Woodland Scenics medium green turf for the first time and it gave me fits until I got used to it. Going to sift on some dirt to tone down the color green somewhat. The graveled area by the Warehouse, in the corner, will become a critter service area. The small building in the front of the layout is going to be a shed for tools and misc. junk. Still working on the Critter and the second flat-car, soon those should be built and be ready for finishing. Well that's it for now, any comments or suggestions are most welcome. Stay tuned. Looks good to me Larry! Thought that I would share a couple more photos of CA Farms with you guys. Have a few days off from work so I hope to get some more work done on the layout. Enjoy. this layout. Please a leave a comment if you read it so that I know that it is being read. Cheers. I like what you have done with your blogspot, you may need to allow/install a follower list so other can observe and link your blog with theirs. Glenn I have gone in to my blog and set-up a "followers" section; so we'll see what happens. I didn't know that you could do that with a blog. It's my first one and it has been fun putting it together. Finally solved the software issue with my Mac computer so hopefully I will be able to post photos now instead of having to switch computers which is a real pain. More to come. Didn't like the "closed door" look as seen in previous pics; so I decided to have the door open and detail the interior somewhat. Put in a wood plank floor and used a texture from the internet to give the inside some depth even though it is a low profile building. Then I stained the door and floor. Still want to "dirty-up" the stain with some charcoal powder. May put a stack of boxes in the doorway to further add 3-d to the interior. Used pieces of a paper-clip for the door hangers and the handle and craft sticks for the door rail, as well as the stops. Still need to add one more stop on the other end of the door rail. The sign was made with a paint program and scaled to size. Then it was printed on plain white paper. Afterwords it was cut to size, framed in card-stock and glued to the building. The established year was taken from the first year that Carl started the "scrapbook"; which seemed like a good year to start. Well that's it for now and comments are always welcomed. Stay tuned. I stay tuned! Fine work, and especially I like the open door and the "texture-idea" for the interior! Weathered the building door as well as the flatcars and some of the critter. Wanted to break up the ground cover color so I used some Woodland Scenics lichen for weeds and also as over-growth along the brick wall. Still need to purchase a driver and a worker to give the scene a sense of scale. Loads more to do, so stay tuned. Been a long time since I last posted anything about my layout, life has a funny way of keeping you very busy. The layout is nearly finished, so I thought that I would share some progress pics. This is the fueling area to the right of the warehouse. Everything is scratch built with card, paper, wire, lighter-parts and a paperclip. Then weathering was applied to achieve a well used effect. Here is a different angle of the same area. This is the shed that is on the front right side. Again weathering was applied to both the shed and the fence with some greenery added along the fence. More lighter parts were used as junk and rusted before they were used. Here is an overall view of the layout, sorry that it is not as focused as it could be. The figure still needs to be painted as soon as I can get to the craft store. This has been a fun project and a learning one as well. It is the first layout that I have ever finished. Will still add a few more details as time goes on, but for the most part I consider this finished. Any comments are always welcomed.